Knowing how to clean a computer screen properly will help you extend the life of your monitor, save you money and preserve your vision. Before you dig under the sink for something to clean your monitor with, you need to determine the type of computer screen you have. 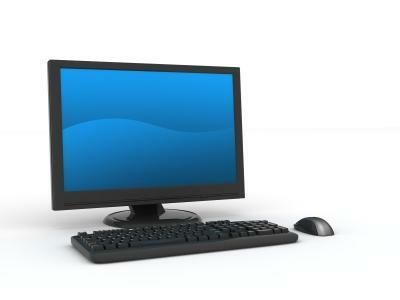 Typically, computer monitors are placed in either of two categories: CRT or LCD. Cathode Ray Tube (CRT) monitors are older models. They are traditionally larger and bulkier than their LCD counterparts. What's more, their screens are made of glass, which means they can be cleaned with commercial products made specifically for glass. In contrast, Liquid Crystal Display (LCD) monitors contain multiple sheets of a non-glass polarizing material with a layer of liquid crystal solution in between. LCD monitors cannot and should not be cleaned in the same fashion as glass CRT monitors. Regardless of whether you own a CRT or LCD computer monitor, it is vital to be extra careful during the cleaning process. Monitors are fragile and must be treated delicately in order to preserve their features. Windex or other commercial glass cleaners are recommended for removing dirt, dust and fingerprints from glass monitors that come with standard CRT computers. However, you should never spray a liquid glass cleaner directly on a monitor, as the solution could seep into the screen and damage the circuitry. To avoid harming your computer screen, simply spray some Windex onto a soft cloth or paper towel, and then gently wipe the glass monitor using even strokes.If your CRT computer screen is exceptionally grimy or contains a ton of dusty smudges, then you could opt to vacuum off larger dust particles. If you choose this option be sure to use a soft brush attachment on your vacuum prior to cleaning your glass computer monitor. Other good cleaning materials for CRT monitors are microfiber towels dampened with a little water or dry disposable dusters, such as Swiffer Duster Cloths or Staples' Lint-Free Wipes, which offer nonabrasive cleaning. You must be extremely careful when cleaning a LCD computer screen, as using the wrong type of cleaners could seriously damage your monitor. Never use a cleaner that contains acetone to remove dirt and debris from LCD monitors. Rather, it is best to dry clean a LCD screen with gentle microfiber cloths or a soft cotton rag. If the dry method does not completely clean the screen, you can add a touch of isopropyl alcohol to a soft cloth, and then wipe the screen using gentle, even strokes. Working on a computer screen that is caked with layers of dirt, dust and debris can be hard on your eyes. In addition, allowing grime to build-up on your monitor may compromise the integrity of the machine and lessen its value over time. This is why it's important to learn how to clean a computer screen properly. However, before you tackle the task, you must first turn off the monitor. Never clean a computer screen while the machine is on. What's more, you shouldn't turn it on again until the screen is completely dry.